No, Heineken, the alcohol-free beer market is NOT going to double in the next four years. It’s deja bu time again in the world of Big Beer, with the return of excited prognostications for the no alcohol/low alcohol sector. All the marketing “experts” involved in the last round of predictions about how fast sales of no alcohol/low alcohol beers were going to expand have now retired or died, apparently – to be fair, it was 25 years ago – and a new generation is again falling for the fallacy of unwarranted extrapolation. The Dutch giant Heineken is leading the charge, with the launch in the UK of Heineken 0.0. Currently no-alcohol beer has a tiny one per cent slice of the UK beer market, but David Lette, head of premium brands at Heineken, is popping up in the trade press declaring that he expects to see the alcohol-free beer category double in the next three to four years, and announcing that to make sure Heineken gets its share of this, it is putting £2.5m behind the launch of 0.0, with a £1.5m consumer advertising campaign breaking in July. If they had given me a tiny one per cent slice of that marketing spend – just £25,000, chaps, very reasonable against what other consulting companies will charge you – I could have saved them all the rest of their money by assuring them that it ain’t going to happen: there will be no doubling of no-alcohol beer sales. And I hate to pour icy water all over young entrepreneurs, but the message is the same for the team behind Nirvana Brewery, East London’s latest, which started at the beginning of this year as the country’s first dedicated no/low alcohol brewery. The no alcohol/low alcohol beer market didn’t take off back in the early 1990s, for a variety of reasons, and for just those same reasons it’s not going to take off now. In 1987 beer marketeers were even more optimistic about the future of alcohol-free beer, after it had apparently doubled sales in a year, to be worth £45 million, with predictions that it would grow tenfold by 1999. Barbican, the market leader, made by Bass, which had been launched in 1979, was spending £2.5m on an advertising campaign to fight off new entrants such as Kaliber, from Guinness, and Swan Light, from Allied, the first draught low-alcohol beer. Barbican’s first television ad campaign had featured Lawrie McMenemy, then the highly successful manager of Southampton, declaring: “It’s great, man.” McMenemy was later prosecuted for drink-driving, suggesting he perhaps didn’t think Barbican was quite as great as he had been paid to claim. Kaliber had signed up comedians Lenny Henry and Billy Connolly, and the actor Michael Elphick, to act as spokesdrinkers: another example of the dangers of celebrity endorsers, since Elphick was to die in 2002 of a heart attack not helped by his drinking up to two litres of spirits a day. Thirty years on, that £45 million the alcohol-free beer market was valued at in 1987 pounds is equal to around £180 million in 2017 pounds – which is more or less what today’s alcohol-free beer market in the UK is worth. In other words, in three decades the sector hasn’t grown at all, in real terms. But 30 years ago, David Lette, today head of premium brands at Heineken UK, was studying for his International Baccalaureate at college in Singapore, according to his LinkedIn biography, and he didn’t join Heineken until 2002, thus missing out on the first great failure of non-alcoholic beer to live up to the extrapolations, and probably explaining why he is so optimistic today that the extrapolations for the no/low alcohol beer market are going to come true. One of the problems for marketeers is that the no alcohol/low alcohol market appears to be very prone to ephemeral and short-lived surges: it looks as if it reacts to a big marketing push, or a supermarket suddenly giving the category lots of shelf space, by showing highly encouraging rises in sales, but those surges eventually die away. It’s not difficult to work out why: people really want to buy the product because they hope it can truly deliver the beer experience without the alcohol, they try it out, encouraged by its visibility, producing a surge in sales, but soon find the experience unsatisfactory, and they stop buying. Because the ultimate problem is – and this is the killer – that no one has ever brewed a no alcohol/low alcohol beer that tasted any good, either compared to “real” beer or any other non-beer alternative. And yet still no-alcohol beer has less of a share of the market than stout, that hugely unfashionable old man’s drink. But if you taste the brews being offered, it’s no surprise. Beck’s Blue, the market leader in the no-alcohol beer sector, has a skunky aroma and a faintly boiled taste, neither of which encourage the drinker to buy a second bottle. BrewDog brought out its 1.1 per cent ABV Nanny State, which has an excellent hoppy nose, better than many “full” beers, but an overpoweringly bitter flavour, with no alcohol sweetness to give balance, so that it finishes thin and one-dimensional, like hop tea. St Peter’s, the Suffolk craft brewer famous for its wacky oval bottles, produced something called St Peter’s Without last year. I refrained from mentioning the beer at the time, following the philosophy that if you can’t find anything nice to say, say nothing. 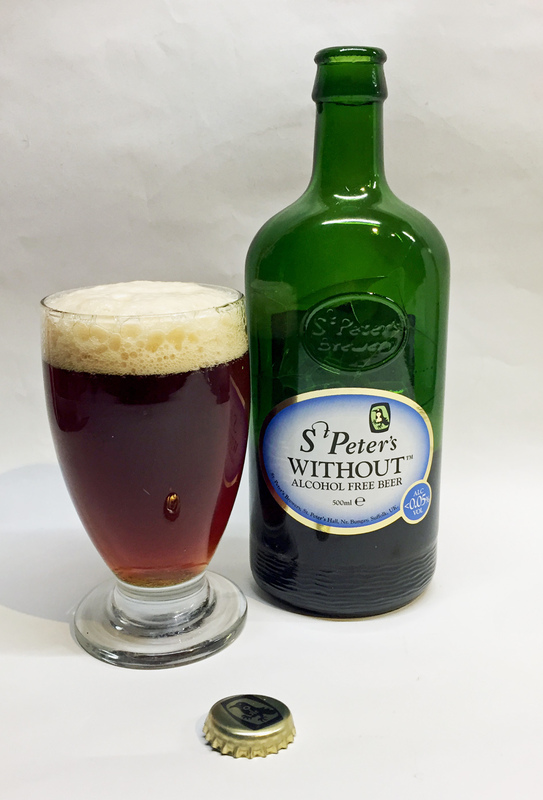 But as we’re talking now about no-alcohol beers – I cannot imagine what St Peter’s thought they were doing, because as a product it’s actively terrible. It smells like raw, unfermented wort, and while there is enough hop usage for it not to be sickly sweet, it’s still too much like the “strengthening medicine” Kanga fed to Roo, and nothing like the refreshing drink beer ought to be. “I’m looking forward to a cool frothy pint of non-alcoholic beer tonight” said NOBODY, EVER. The trouble is when you strip out the alcohol you strip out a lot of the flavour. I have heard that alcohol-free wheat beer is the best, but have never felt the urge to actually part with any of my money to find out. I’m at the retail level. Please stop trying to send us alcohol free alcohol in a liquor store. Advertise it on the grocery shop level. I don’t have room for it on my shelves. Or make it so much cheaper that it’s worth freeing up a shelf .$5 a 6 pack. I had to write up NLAs for this year’s On-Trade Preview. Naturally I did it without tasting any because – well, because. But out of curiosity I did want to try the NLA wheat beers that (it is claimed) are catching on in Germany. Have you tried any? Are they as vile as the rest? Pretty well Ted. Regrettably I’m familiar with Erdinger and Schneider which come in 50cl bottles and when first tasted seem relatively OK. That feeling dies by the time the 25cl point is reached and it turns into the same old cardboard. Alcohol-free beer is always going to be a distress purchase. People are never going to see it as a desirable product in its own right. And it doesn’t help when it’s priced at a similar level to normal-strength beer in an attempt to give it a “premium” image. A point that occurred to me is that maybe the manufacturers of alcohol-free beers are making a mistake by positioning them as an alternative to normal-strength beer, rather than as an alternative to soft drinks. If you look at them that way, you are using something else to judge them against. And most soft drinks are, to many people’s palate, overbearingly sweet, whether or not using sugar or artificial sweeteners. Most low-alcohol beers are still thin and dull, but Brew Dog’s Nanny State (around £1.25, widely available) is clean and hoppy, with body and balance, and stands up well against its alcoholic craft beer cousins. I think there is a chance for some of them catching on. Nanny State is now 0.5% and I do have two uses for it: As an alcohol free beer (when driving, etc) and as a blending beer. It turned an overly malty big beer into a more balanced experience, so I’d give it some thought in the cellar. What does annoy me is that you can’t get them on the road. I don’t like sweet drinks (and most alcohol free drinks are sweet), so I’ll often go for tonic or coffee. I also do see more people drinking alcohol free at parties and BBQs. For all you doubters out there. I have tried pretty much every alcohol free beer out there with mixed results for all the reasons most of you have put below. This new Heineken beer is easily the best available, I just hope it take hold in this small market and makes a dent into Becks Blue sales as the Heineken is far superior. Great beer flavour but avoids the harsh after taste you get with so many others. Well done Heineken. I agree with everyone’s comments so far, but you are forgetting one demographic that can only look forward to cold non-alcoholic pints in any form. They are they unfortunate lot like me, who due to current or previous illnesses are not allowed to have any alcohol. I for one, had Sepsis, which due to the damage it did to my Kidneys means this is all I’m left with. I therefore hope that one day someone might actually crack this, as I don’t want to drink J2O’s, Fizzy drinks or worse, water with a slice of Lemon while out with your mates. Out of all of them, Heineken is my current favourite. I really like them. The quality of the non alcohol beer depends on the brand. Just like with real beer. I think that there is a positive future in non alcoholic beer.